Years ago I our town possessed a large bookstore that was part of a chain which has since gone out of business. Now we have locally owned used bookstores. (Most of the time this is a good thing. However, I find that they use their position to charge new book prices on used books! Hence my frequent trips to Goodwill. But I digress . . . ) When we had this large bookstore, I discovered The End of the Beginning : Being the Adventures of a Small Snail (and an Even Smaller Ant) sitting on the shelves. I almost bought it. And then, all at once, the bookstore closed and I couldn't. I have sought a copy of this book for a good year at least but hadn't found it until last week! Goodwill saved the day! Happiness and joy, etc. I couldn't have found this book at a more perfect time. I think it incredibly suited for Bookworm1 at the present moment. We read through this yesterday and it was a pleasure from the end of the beginning. Here is probably where I have to make a confession, of sorts. I've never read anything by Avi. I don't know who Avi is. I didn't look it up before publishing this post. (Slacker than I am!) I will say that I enjoyed this book enough that I would happily pick up another title by the same. Although from the titles I have seen, I have a suspicion that the author would be a "hit or miss" as far as I am concerned. In the case of The End of the Beginning thought, it was a tremendous hit. 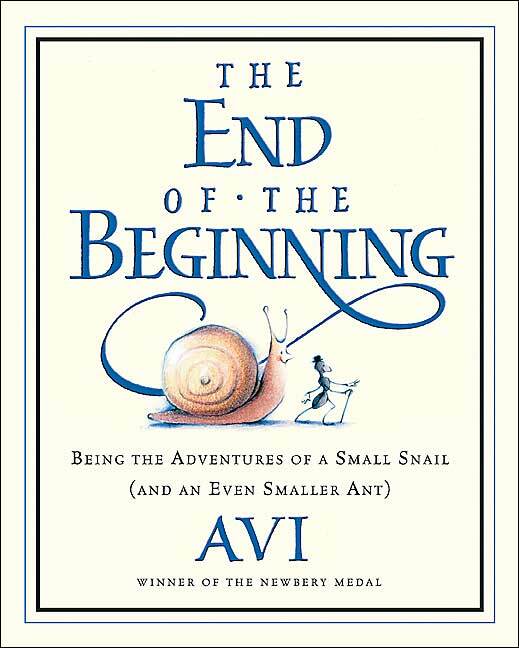 Avon Snail is a "rather small snail" who reads one book every day. In his reading he has encountered many creatures who have gone on adventures. He decides that if he does not go out into the world to seek adventures, he will be a most unhappy snail. Adventures must be sought! And so he prepares his house and plans to leave. As he is closing the door to his home, an ant by the name of Edward stops to chat. Edward is an ant of the world, very familiar with the concept of adventures and quite worldly-wise. He agrees to accompany Avon on his explorations and they set off on their journey. Oh, golly, golly, golly, oh. "What an inspiring song," said Avon. "One of the better things about it," Edward pointed out, "is the fact that it can be sung from either end. I sing it from the beginning, and my father sings it from the end." "Can it be sung from the middle?" "Absolutely," said Edward. "That's how my mother always does it. As you can see, we are a family of individuals." "Ah, but at least you are all singing the same song." The above passage gives you a general feel for the entire book. The characters talk in circles and Avi uses a lot of tongue-in-cheek. I snickered to myself a time or two, as the humor often went over Bookworm1's head. At the same time, the story was amusing enough to cause my bookworm to burst out laughing. So we both had a good time. I think this is a super cute story that makes for a quick, pleasant read. (There are only 17 chapters but each one is roughly 3-4 pages in length. Double-space type! Short.) It's a pleasant beginning chapter book or a speedy read-aloud when you want to relax and enjoy yourself alongside your child. I highly recommend it! "Don't look at the world with your eyes but with your heart." "But Edward," said Avon, suddenly alarmed, "I don't have eyes on my heart." "I was speaking as a poet might speak. You can't have adventures without poetry." This one sounds like one my younger dd might enjoy. Thanks for the review! Only a few years ago when I was a kid ;) I ate up Avi's books at my library. The True Confessions's of Charlotte Doyle and The Man Who was Poe were my favorites. Any book that has a snail in it sounds good to me. Going to reserve this one for the ducklings and see if Deux will enjoy it. We've read a few of Avi's books, including the Crispin books and the Poppy books which are as different from one another as you could possibly imagine. He's quite interesting and diverse I think. 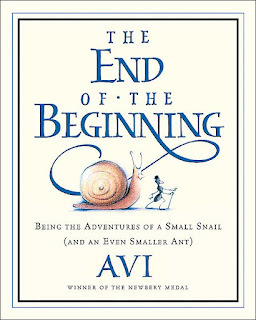 I read some of Avi's books when I was younger. The one that stands out was already mentioned (Charlotte Doyle). I had a deep abiding love of Avi when I was younger, and I doubt I could tell you why. Hit or miss would actually be a good way to put it. He's often incurably depressing, but then again I have a penchant for incurably depressing books. I had never heard of this one, but it sounds great.